The country’s governing coalition suffered heavy losses in Wednesday’s election. But right-wing firebrand Geert Wilders picked up fewer seats than expected and finished a distant second. The setback for extremism leaves mainstream political parties more fragmented than ever. The Netherlands' centre-right Prime Minister Mark Rutte was on course for a resounding victory over anti-Islam and anti-EU Geert Wilders in an election on March 15. 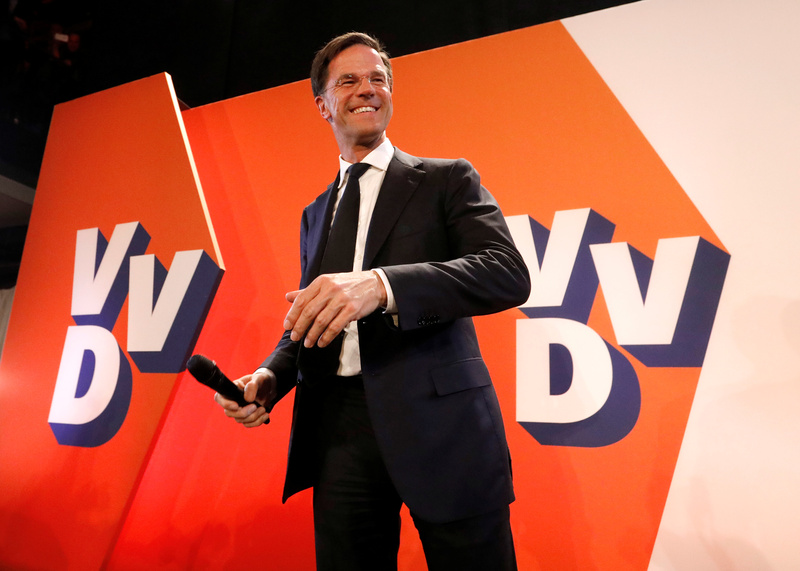 "It appears that the VVD will be the biggest party in the Netherlands for the third time in a row," a beaming Rutte told cheering supporters at a post-election party in The Hague. "It is also an evening in which the Netherlands, after Brexit, after the American elections, said 'stop' to the wrong kind of populism," he said. Wilders said he had not achieved the electoral victory he had hoped for and was ready to offer tough opposition. "I would rather have been the largest party.... but we are not a party that has lost. We gained seats. That's a result to be proud of," Wilders told journalists. With more than 95 percent of votes counted, Rutte's VVD was projected to win 33 of parliament's 150 seats, down from 41 at the last vote in 2012. Wilders’ PVV was set to win 20 seats, a gain of 5, but short of the level suggested by opinion polls during the campaign. The Christian Democrat CDA and centrist Democrats 66 parties were projected to have 19 seats each. The Labour Party, the junior partner in the outgoing coalition, suffered its worst ever result, winning just nine seats, down from 38 last time.